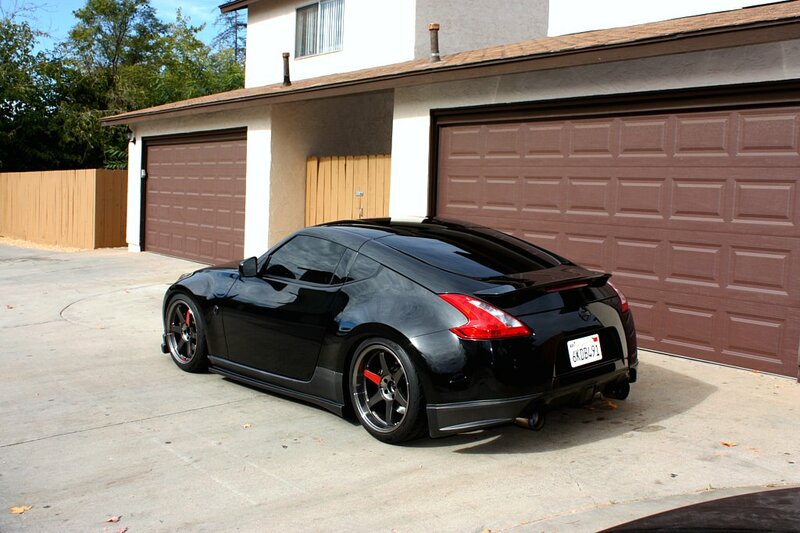 Lately I have been trolling the Z boards and every day I find myself falling more and more in love with the 370Z. Upon viewing the first pictures of it three years ago, I can recall my remarks of disappointment and borderline disgust. 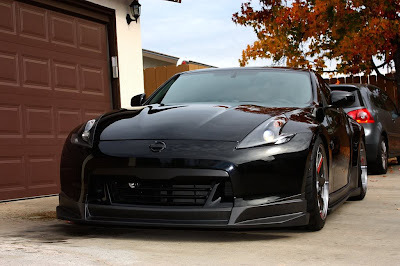 My only answer to my previous opinions is that the Nissan has either grown on me, or my taste has changed significantly, as I now believe it to be nothing short of GORGEOUS. 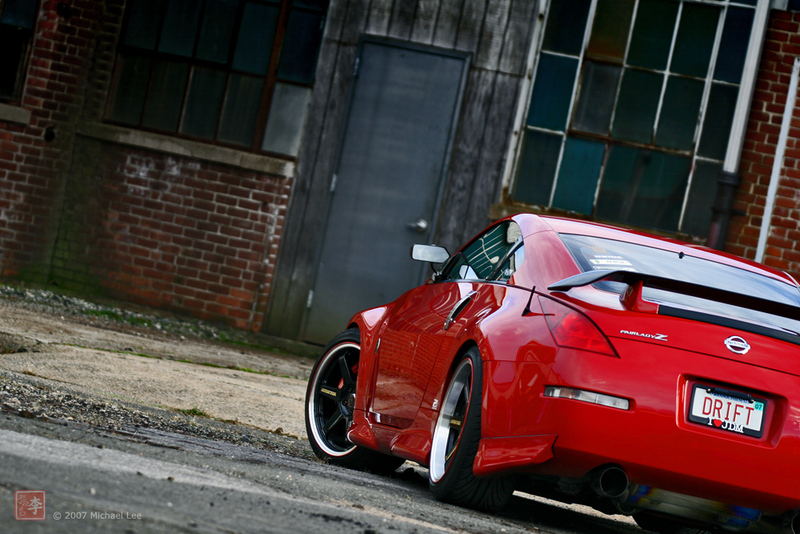 Here are a couple pictures of two Z's at which I cannot stop staring. Brian and I have been e-mailing daily for the past couple weeks discussing the path this project is taking. I have a certain theme in mind for this car; one that is not always easy to convey to others. Rarity and quality of parts is a substantial element to that theme, but having the rarest parts does not always mean the best end result. I try to be cautious in the decisions I make in regards to parts for this car. "Clean" is a priority. The challenge is tying everything together smoothly. That said, we have come up with some ideas set to be put into motion at some point over the next few weeks. These modifications will likely elicit mixed reactions. Some will like the changes, some will not. Nonetheless, the G will certainly be unique... We are going to outline these one-of-a-kind big brakes with a new set of wheels that have never seen a G37S. We will be downsizing from the current 20" so as to provide a bit more sidewall rubber, while losing a few pounds in weight. I will not reveal the make and model of these new JDM wheels, but I can say that the offsets will be a bit more aggressive than the current (+25, +35) set-up, although hardly in line with the recently hallowed Herrafrush trend. We are also going for a more aggressive exhaust note. I am going to swap out the current Fujitsubo Legalis-R set-up for another JDM system that will truly provide a more aesthetic appeal to the undercarriage of the G. I don't think I'm going out on a limb when I say that it will be gorgeous! 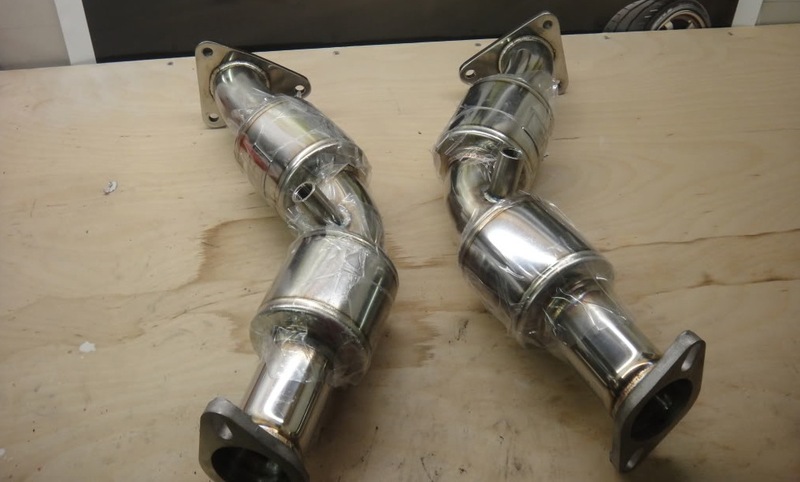 We will mate that system with a set of MXP Double-Resonated Test Pipes, and possibly a new Y-Pipe (brand undecided at the moment). The tame, mild note of the G's exhaust of today will be exchanged for a far more mean and aggressive growl, although far from obnoxious in nature. 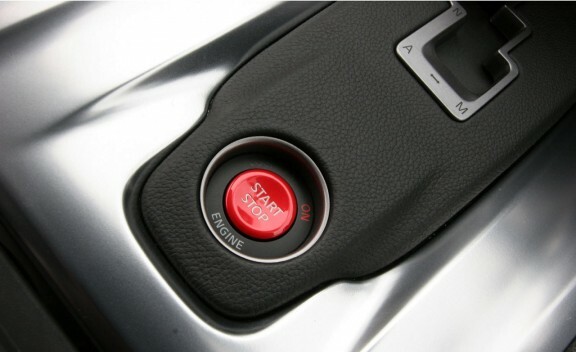 Other than that, a Stillen short shifter will be installed, as well as a start button from a Nissan GT-R. I think that will flow nicely with my interior. "Now what did you buy?" "How much did that cost?" "Do you really need that?" These are the sort of questions a modifying fanatic faces regularly. There are many out there who just cannot fully grasp, respect, or appreciate all that goes into building the "perfect" car. They do not understand the novelty of having a one-of-a-kind work of art - that is precisely what the car is to the enthusiast. Something of which to be proud. A project that, if enough time and energy is invested, can evolve into a work of art. Thus, regularly fielding this realm of questioning becomes a source of monotonous frustration for a true tuning fiend. Before I parted out my Z, I recall going to the dealership inquiring about the trade-in value. The salesman who inspected the car told me they would give me roughly $500 over the Kelley Blue Book value of the car at that time. Puzzled, I wondered aloud why the car was not worth more to them considering the tens of thousands of dollars in modification and custom work invested. I remember the salesman asking me, "Did you buy your lunch today?" When I answered in the affirmative, he told me that I was never going to get my lunch money back. Using the analogy that my aftermarket parts were much like the ten dollars I had spent on my lunch that day, the dealer, quite bluntly, informed me that I was not going to get the money invested in parts back, either. Modifying a car is not an investment. An enthusiast certainly does not buy parts to increase the value of the vehicle. He buys parts to create something unique. He buys parts to feed an addiction. Modifying is a pastime, or a hobby, to some. To others it is a more serious recreation. To others, a genuine passion. There are different degrees of automotive enthusiasts. It is no secret that I am discriminating and particular when it comes to choosing parts for my cars. 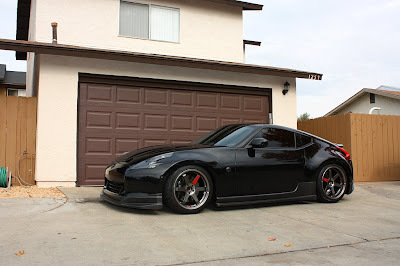 My goal is to build a car that one cannot see anywhere else but my driveway. One that is distinctly mine. I have already gone through two big brake kits, I am currently debating changing exhaust systems, as well as looking into different wheels... Among other things. To say the least, I am never satisfied. My projects are never complete. So, when I ponder the irksome inquiries of those scrutinizing masses that cannot seem to grasp the notion of what it means to be a true enthusiast, I consider a sticker I currently have resting on the back seat of my G... Eat, Sleep, JDM. 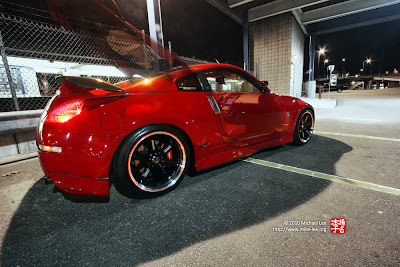 One cannot visit a Nissan (and now, likely, a BMW) internet forum to encounter too many members who will not only recognize the username LEEMIK, but who hold it in high regard, as well. Although a bit hyperbolic, it is not much of a stretch to suggest that Mike Lee is somewhat of an icon in certain aftermarket automotive circles. As a car enthusiast, I consider myself modestly fortunate to live in the same state as Mike Lee. 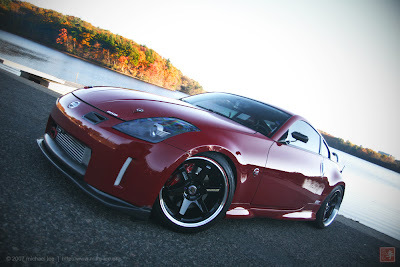 My first interaction with Mike came by way of membership to a New England 350Z/G35 forum back in 2005. Later, in 2006, I put together, last minute, the first Northeast Holiday/Charity Meet. It was a small turnout of eight or nine 350Z’s at a local restaurant. Although they were the mechanism that brought us all together, the cars were not the spotlight of this gathering. In fact, I do not believe a single picture was snapped throughout the course of the day. It was more an opportunity to share in conversation and discussion. That was my first occasion to meet, in person, the legend I had come to know by way of internet forums. Today I would not only call Mike a great resource and valuable asset to any automotive community, but a good friend, as well. The reputation Mike maintains has not come in vain. He has certainly earned his keep within this culture of enthusiasts. With many accolades, awards, and features under his belt for his accomplishments and his bold, audacious endeavors with his vehicles, Mike is a true pioneer. A trendsetter. Often imitated but never topped, Mike Lee has set the bar for many. And set it high. 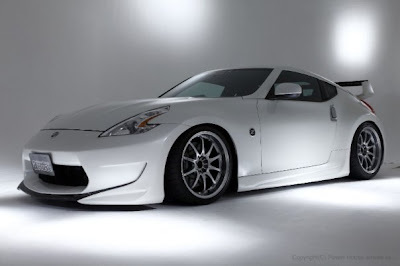 Years later, Mike’s 2004 Nissan 350Z is still referenced daily on one of the most popular car forums on the net, MY350Z.COM, as a model to aspire. Powered by a pair of Mitsubishi TD05H-18G turbos, the GReddy twin turbo kit provides this 350Z with upwards of 400 horsepower on low boost. Arguably, however, the power of this car is not its most attractive attribute. Upon viewing it, the attention to detail is the facet of this car that leaves most people wiping up drool. It is truly a work of art, not only in form, but in function as well. The parts list for this Z33 is impressive in every way. If Mike’s Z was to play host to a Brand Name afterparty, the guest list would include a Who’s Who? 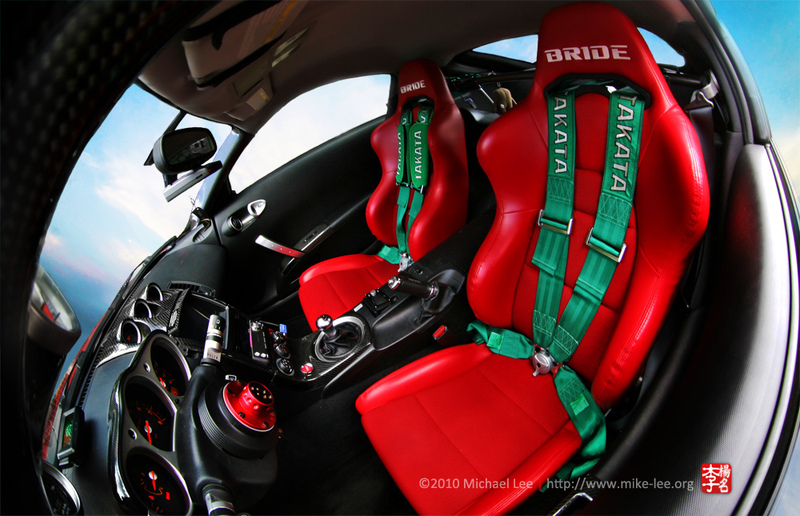 of A-listers such as Amuse, ARC, Bride, Cusco, GReddy, Nismo, Stop-Tech, Top Secret, Varis, and Volk Racing. 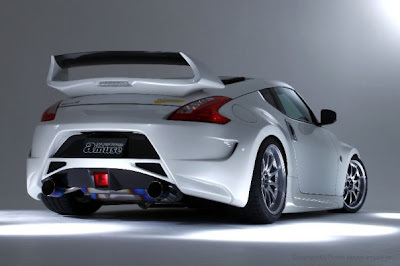 The times have certainly changed and the tides have indisputably shifted, as we are now well into the age of Hellaflush/Stanced Z’s occupying every other forum thread and eating up features. 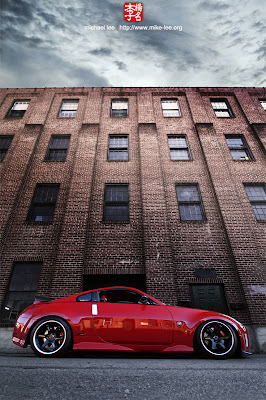 It has been a while since Mike has tended to his Z, as most of his attention is now centered upon his e92 M3. 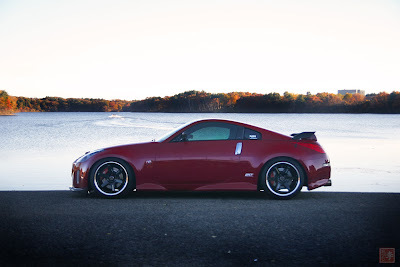 However, in a world where it seems as though one out of every five teenagers now owns a Z and are realizing all that is necessary to score some notoriety is investment in a set of wheels, super-stretched tires, and suspension rendering the car hard-pressed to clear a discarded piece of chewing gum, Mike’s Redline Z has stood the test of time. It is still the standard upon which to measure all Z’s. As many now declare the almost twenty year-old Toyota Supras, Mike Lee’s Nissan 350Z is, quite simply, timeless. After months of investigation, research, inquiry, some trial-and-error, and what is likely a few abounding phone bills for Brian and JT Motoring, we are ready for the installation of the Project Mu big brake kit. This stage of the project has proved to be a challenge, if for no other reason, because we are venturing into unchartered waters. No one has ever attempted this modification before, so, in some ways, luck will play a role in the end result. There are parts from multiple Project Mu big brake kits that, after careful research and inquisition by way of e-mails and phone calls to multiple resources, we have strewn together to get this right. The G was dropped off at JT yesterday. I should have it back in my possession by tomorrow evening.